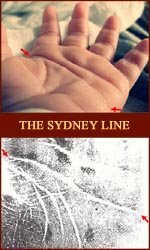 The Sydney line: an underestimated hand mark in palmistry! The Sydney line: an underestimated hand mark. 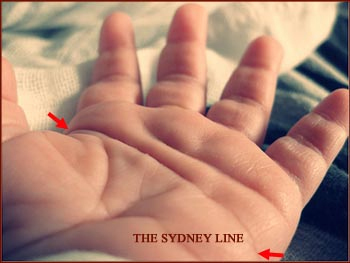 Many years ago the Sydney line was discovered as another hand line mark for Down’s syndrome – the other handmark is the ‘famous’ simian crease. How come that the diagnostic significance of the Sydney line is still underestimated? This article describes an overview of the global palmistry- & scientific research related to the Sydney line. In 1967 a Belgian study on Down’s syndrome was published which pointed out that besides the ‘famous’ simian line, an ‘extended proximal palmar crease’ is also a significant feature in Down’s syndrome. One year later some researchers from Sydney, Australia (Purvis-Smith & Menser, 1968) reported that this fascinating palmar line is also frequently found in the hands of patients with congenital rubella – from that point researchers adopted the name used by researchers from Sydney: the name of the ‘Sydney line’ was established! Dozens of studies have confirmed the diagnostic significance of the Sydney line – sometimes the discriminative value is even higher compared to the simian crease! The significance of the Sydney line can be related to various medical problems (such as: Down’s syndrome, leukemia, Alzheimer dementia), and psychological problems (in general: developmental problems at young ages). A single transverse crease variant. The simian line has been well-known since R.L. Down discovered in 1906 it’s significance in Down syndrome – it was his father who actually discovered the Down syndrome in 1866. Since then the simian line has been studied in many other aspects of life. The full article presents an overview of the most relevant aspects of the simian line. HOW TO RECOGNIZE A SIMIAN LINE? A typical ‘simian line’ is characterized by the presence of a single line that runs across the palm of the hand. People normally have three major hand creases in their palms. Only when the simian line is present there are only two major creases. By the way, the simian line can manifest in various line constellations in the palm: some examples are present at the left. WHAT DOES A SIMIAN LINE MEAN? The simian line appears to be related to rich scala of medical problems. Wrongdiagnosis.com presents a list of 93 causes of the simian crease, including Down syndrome, fragile-x syndrome and the cat-cry syndrome. However, one should never forget that the simian line (simian crease) is also found in the hands of perfectly healthy people! Hand Analyst Pamelah Landers presents ‘Gift Markings’ Hand Analysis from Santa Rosa, CA (USA)! IIHA Lifeprints Hand Analysis – the heart line & ‘Gift Markings’.